Munichbeergardens.com is an all-in-one reference guide to the many great beer gardens in the Munich area. Whether you are a beer garden tourist exploring some of the famous beer gardens in the undisputed beer capital of the world, or a seasoned beer garden goer looking for a change of venue, this guide has something to offer everyone's personal taste and preference. The Google maps on each beer garden page are useful for navigation while beer garden hopping by bike or foot. Zoom and pan around the map to find beer gardens outside the edges of the default map view. Most traditional beer gardens in and around the greater Munich area are listed below as well as indicated on the above map. In case there are any traditional beer gardens missing from this list, please add them here by clicking the edit link above. 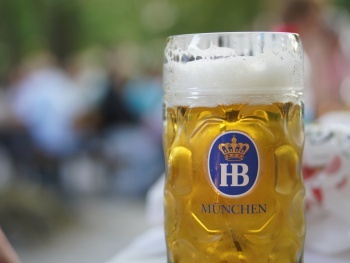 Beer gardens originate from a 19th century Munich when they became popular venues during the rule of Max I., King of Bavaria. At this time, a dark lager was the most common type of beer. On order of the king, beer had to be brewed during the winter months, because fermentation of this particular type of beer had to occur between four and eight degrees Celsius. So that the large Munich breweries could also sell their beer during the summer, they built cellars along the banks of the Isar river for storing the beer. To further reduce the cellar temperature, they covered the banks in gravel and planted chestnut trees to provide shade during the hot summer months. Soon thereafter, beer cellars were used not only to store beer but also to serve beer as well as food to the public. Simple benches were placed amongst the trees of these so-called beer gardens which quickly became popular amongst the Munich population. However, this new trend soon had a detrimental effect upon the smaller breweries and restaurants which led them to collectively petition King Ludwig to forbid beer cellars from serving food to the public. A royal decree was consequently passed, preventing all beer cellars in and around Munich from serving food. Instead, the guests of the beer gardens were permitted to bring their own food. While the law is no longer in effect and as all beer gardens now serve food as well as beer, the Bayerische Biergartenverordnung states that "real" beer gardens should still allow their guests to bring their own food. The general understanding nowadays is that guests are welcome to bring and consume their own food in Munich beer gardens. Only those beer gardens which still adhere to this Bavarian tradition can be considered traditional beer gardens. There is no waitress service in areas where own food can be consumed. Instead, there is a self-service canteen where both food and drinks are sold and where the beer is often tapped from wooden barrels in Maß glasses. Most beer gardens now have two areas, a served area with regular tables and chairs and a self-serviced area with wooden benches for those who buy beer and/or food in the canteen. The only rule that guests need to respect is not to bring their own beer. Munich's beer gardens have no door policies or other social barriers. They're simply a place for everyone.